While the Pakistani delegation raised the issue of targeted firing by the BSF, it was made clear that such an action is resorted to when unprovoked firing from the other side kills troops, civilians or leads to other damage. The meeting between BSF and Pakistan Rangers took place on Friday in New Delhi. New Delhi: The BSF strongly raised the issue of unprovoked firing, killing of civilians and usage of tunnels for cross-border crimes along the Indo-Pak border during a high-level meeting with their counterparts-- Pakistan Rangers -- that concluded in New Delhi today. The Rangers, led by their DG (Sindh) Maj Gen Muhammad Saeed, had arrived in India on November 8 as part of the biannual talks with the Border Security Force (BSF), which was led by its Director General K K Sharma. The visiting delegation went back this afternoon. "The Indian side firmly and strongly took up specific issues of concern including incidents of unprovoked crossborder firing, smuggling of narcotics, infiltration attempts, tunneling and defence construction activities," the BSF said in a statement. A senior officer said the BSF also asked the Rangers to take steps and ensure that their land is not used by terrorists to infiltrate into India. It specifically underlined the discovery of a number of tunnels along the International Border in the Jammu region that are used by the other side to facilitate cross-border smuggling and infiltration, the officer said. 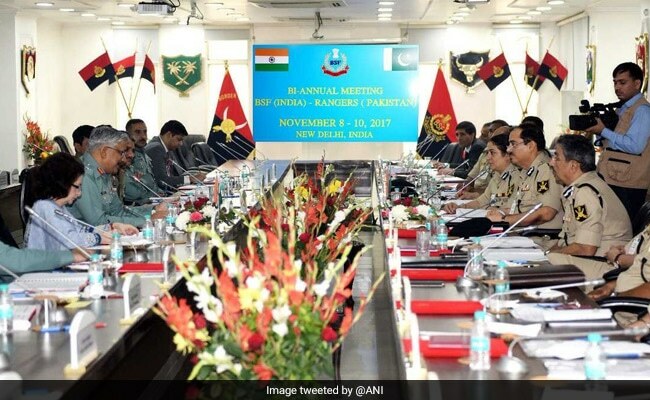 The BSF said the talks, in presence of officials from the home ministry and anti-narcotics departments of the two countries, were held in a "constructive atmosphere" and the need for cooperation to maintain the sanctity of the borders was stressed upon. "The issue of inadvertent crossing over by the border population and ways to facilitate their return on both the sides was also discussed," it said. The BSF said it was agreed between the two sides that "utmost caution and care should be exercised in dealing with the civilians." The officer said the two sides also stressed on the need to have an "increased frequency" of field commanders meeting along the Indo-Pak International Border (IB) and the requirement of timely exchange of information. "The on-ground flag meetings between the junior commanders, commanding officers and other senior officers has been going on, but it was stressed to have them timely and quickly, especially when such meetings are essential to thrash out issues," the officer said. The two sides also decided to ensure that the wild growth of the 'Sarkanda' (elephant grass) along the IB will be checked and it will be disposed off within the existing norms. "The talks ended with both sides agreeing on constant endeavour to maintain peaceful and tranquil borders," the statement said. The next round of these talks is scheduled to be held in Pakistan. India's 3,323-km-long border with Pakistan runs through four states-- Jammu and Kashmir (1,225 km which includes 740 km of Line of Control), Rajasthan (1,037 km), Punjab (553 km) and Gujarat (508 km). While the BSF guards the International Border (IB) independently, it works under the operational command of the army while working at the LOC.